Tanker Atlantas in the Naftoport terminal, Gdańsk. According to report published recently by Actia Forum, 2017 turned out to be record-breaking for polish ports. Annual cargo turnover amounted 87.3 million tones, what indicated 7.8% increase. All polish ports had the highest turnover in history. 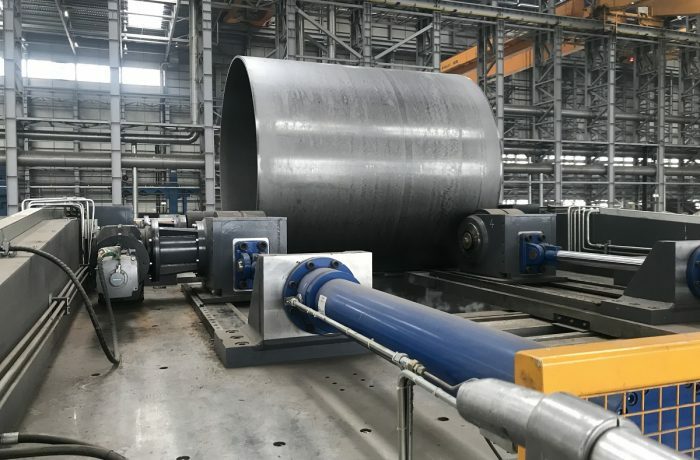 Gdańsk broke the barrier of 40 mln tonnes. Positive changes were recorded in all analyzed seaports. 87.3 million tones, what indicated 7.8% increase. • All Polish ports had the highest turnover in history. 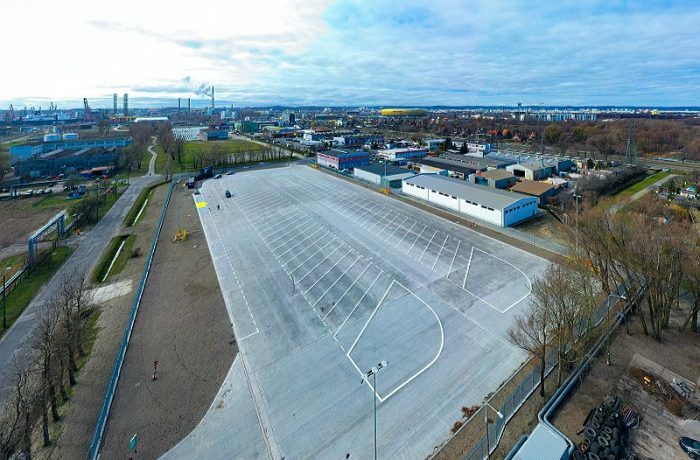 Gdansk broke the barrier of 40 million tonnes (+3.3 mln tonnes), the port of Szczecin – Świnoujście exceeded 25 million tonnes (+1.3 mln tonnes) and also port Gdynia achieved 21 million tonnes (+1.7 mln tonnes). • The increase in general cargo handling (+5.0 mln tonnes), as well as increases in liquid fuels (+1.9 mln tonnes) and ore (+0.8 mln tonnes) were crucial for a good result in total cargo turnover. Large drop was registered in grain turnover (-1.6 mln tonnes). • General cargo accounted for 50% of total ports’ turnover (+5.7%). 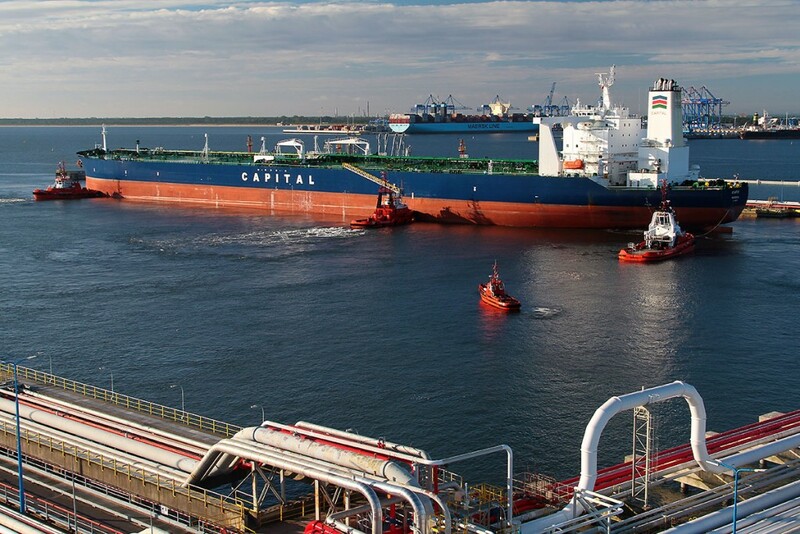 Liquid fuels equalled 21%, coal and coke 11% of cargo turnover in Poland. • Very good year on the container handling market (+17.3%). In 2017 nearly 2.4 mln TEU were handled in Polish ports. Over 21% increase in port Gdansk with an annual result about 1.6 mln TEU. Port Gdynia also gained (+10.7%), annual turnover equalled 0.71 mln TEU. Increase was also recorded in port Szczecin – Świnoujście (+3.0%), throughput exceeded 93 thousand TEU. 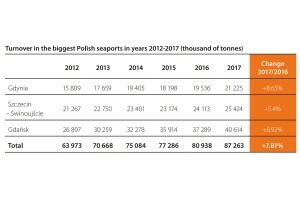 Table form the report by Actia Forum – turnover in the biggest Polish seaports 2012-2017. • Last year, ports handled 1.88 million passengers (-1.02%) as part of regular ferry services. Most new passengers arrived in Świnoujście (+44 234 people). • In 2017, the turnover of freight units in ro-ro technology increased by 9% and reached the level of 675 455 units. 416 440 passenger cars were served in the ferry traffic (-1.32%). • New ferries joined the fleet of ro-ro vessels. Polferries added ferry MV Cracovia to operate on Świnoujście – Ystad route. 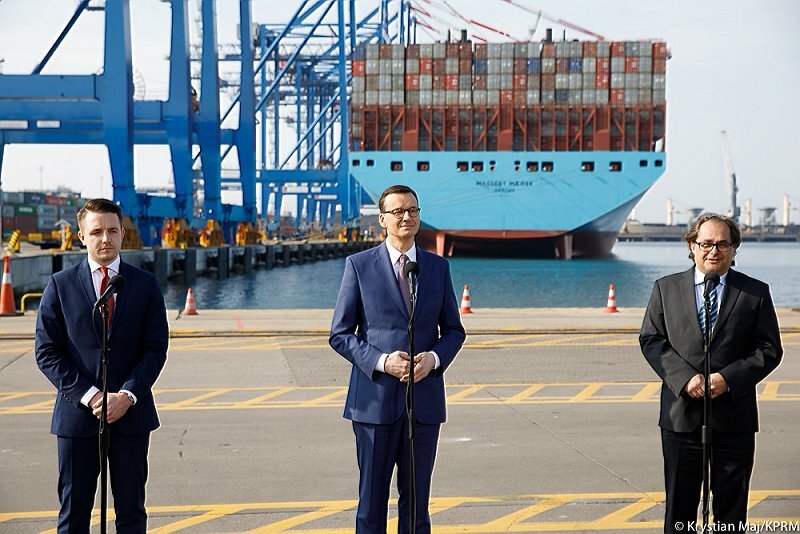 Stena Line introduced MV Gute to Gdynia-Karlskrona line and also launched a new connection Gdynia – Nynäshamn operated by ro-ro ship MV Elizabeth Russ. • Very high increase in cruise traffic in Polish seaports. The number of calls equalled 109. In all major Polish ports 122.7 thousand tourists were served in 2017. • The port of Gdynia remained the largest Polish cruise port (88,6 thousand passengers), but port of Gdansk gained the most. The number of calls doubled and also 150% increase in number of visitors was recorded.